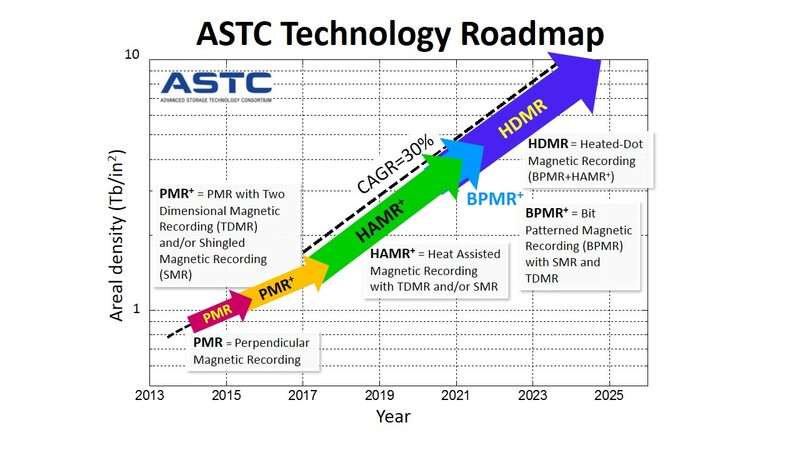 ComputerWorld is reporting on a roadmap from the industry consortium ASTC where they predict magnetic hard drives will reach 100 TB by 2025. This is based on the figure below, where they project data areal density will increase a ten-fold from today’s 1 Tbit per square inch. The technology to make this work, is Heat Assisted Magnetic Recording (HAMR), which integrates a laser into the hard disk read/write head. Bit patterned magnetic recording (BPMR) will take this further by isolating the bits into smaller “islands”. Finally, Heated-Dot magnetic recording (HDMR) combines the two technologies to reach 10 Tbit / square inch. However, it is unclear if these technologies will be compatible with the helium filled drives HGST released earlier this year. From the chart, it seems the new technologies are partly based on Shingled Magnetic Recording (SMR). If this is not compatible with seven platter helium drives, we are stuck at only five platters. The biggest of this kind right now is Seagate’s 8 TB disk, but that is already at about 2 Tbit / inch. 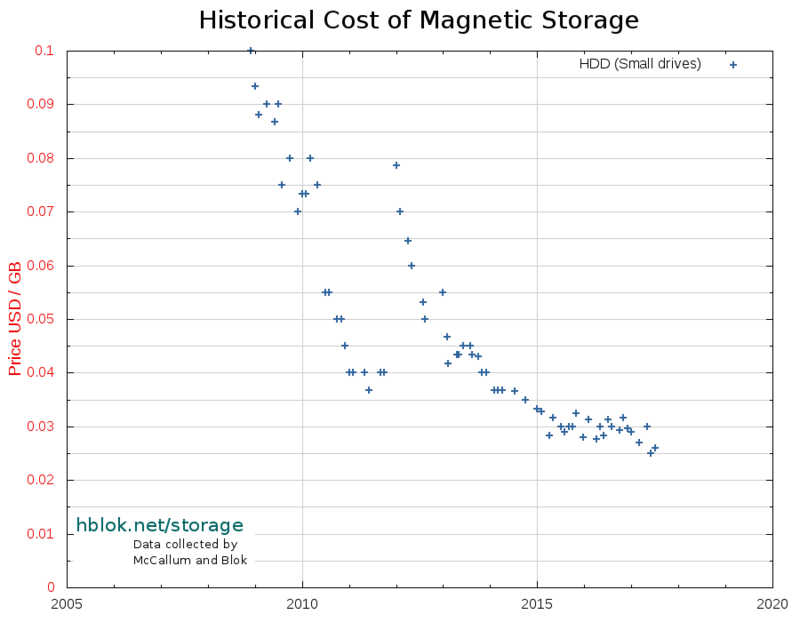 Therefore, the increase will “only” be five-fold, starting at 8 TB, for at total of 40 TB in a 3.5″ drive. A four times increase of today’s biggest drive in ten years would not be very impressive. At 24 GB/day, or 8.8 TB/year, it would take 114 years to reach 1 PB. Several SSDs have gone past that point, and still work fine. Last year, I wrote about estimates for durability of SSD drives. Looking at how long it would take to exhaust the theoretical limit of the storage cells, based on different write speeds and quantities. The assertion was: It would take a very long time, and other technical failures were more likely to render the drive useless long before all cells were used up. In fact, the owner is not likely to outlive full cell exhaustion. This has now been confirmed through an experiment. Over at Tech Report, they have done an endurance experiment lasting more than a year, with several consumer drives. For months, they have been writing data to the drives, while monitoring drive health, and verifying correctness. Some of the drives were rated for 20 GB / day for three days, which means about 22 TB. However, several of them made it past the 1000 TB, or 1 PB, mark. That’s about 50 times the advertised endurance rating. And two of the drives, a Samsung 840 Pro 256GB, and a Kingston HyperX 3K 240GB, have made to past 1.5 PB. It’s not all clear from the article exactly when they started, or how much they write per day. However, assuming a year to get to 1.5 PB, that’s 4.1 TB / day, or 47 MByte/s. The actual write speed is probably higher, but this leaves time for verification as well. To put these numbers into perspective, I’ve extended the table from last time, and added a line for the speed of the Tech Report endurance test, as well as extra columns for multiple years total. As can be seen, the endurance test is running at 171 the write speed of what was identified as “heavy use”. Furthermore, the heavy use scenario is within what the typical consumer drives are rated for, i.e. about 20 GB/day. What about the time to failure estimates; how do they compare to the empirical evidence? Last year, I noted that a 256 GB drive with cells of 10k write cycle life span (typical MLC memory), would take 256 years to reach 10% of failed cells, and about 350 years for full exhaustion, assuming 24 GB/day written. It turns out that was a bit optimistic. At 24 GB/day, or 8.76 TB/year, it would take “only” 172 years to reach 1.5 PB (where the Tech Report drives are now). If we go by 1 PB, it would take 114 years. This is all for MLC memory. If we look at TLC, typically rated for 1000 write cycles, the endurance numbers are also a tenth. I.e. they would fail between 11 to 17 years of sustained 24 GB/day writes, again assuming a 256 GB drive. If larger drives are used, the time to failure also increases. This is because there are more total space to level the writes across. In fact, doubling the size of the drive, will in theory double its lifespan. So an MLC 512 GB drive would last some 228 years, and a 1 TB drive 456 years. For TLC, the numbers are again a tenth, so 22 and 45 years respectively. 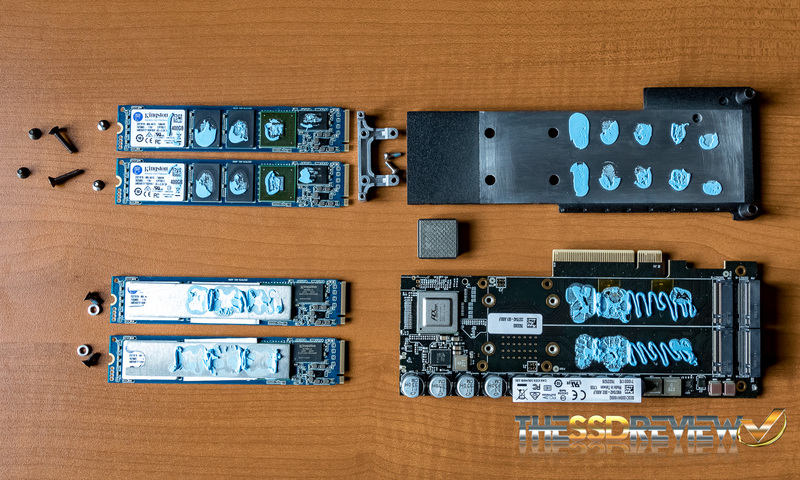 This is all well and good, and should at least put the final nail in the coffin regarding worries for SSD reliability. The only concern which the Tech Report experiment raises, is the way the drives fail when they do reach end of life. Of course there are plenty of relocated sector warnings in the SMART data beforehand. However, once they are past the point of no recovery, all data is lost. Several of them cannot be accessed at all. This is of course a bit different from spinning disks, which usually keep on reading some of the tracks, even if other parts are broken. It highlights the fact that monitoring SMART data should be a standard procedure, and part of good data hygiene. Of course, a good backup strategy is required, regardless of drive type or usage pattern. If you need massive storage, 6 TB disks are already very competitively priced. However, the 3 TB WD Green still gives the most GB per coin. Amongst SSD, several 1 TB disks rank towards the top, but still at ten times more than magnetic. Finally, USB flash drives and SD cards are coming down in price, with a large 64 GB option at the top. There has been several announcements of products you cannot buy yet lately. On the following list, all are for sale and immediate delivery. The list has seen significant updates since last time, in product ranges, prices: Western Digital now has five colour codes for their desktop disks, three of which are included here. There is the inexpensive large but slow Green, the Red for NAS and RAID with extra warranty, and the Purple in between. Also new since February are the 5 and 6 TB disks. At 92 Euros, the 3 TB Green is at the top of the list at 32.4 GB per Euro. It is interesting to note that the 6 TB version is already towards the top, at just a bit more than double the price; €202, or 29.6 GB/€. For external disks, the 4 TB Elements Desktop is at the top, for €135, or 29 GB/€. Amongst the SSD disks, the largest are now at the top, with Crucial 1 TB, 512 GB, and Samsung 1 TB all around 3 GB/€. Most interesting, is the fact that the Crucial claim to be MLC while the Samsung SSD 840 EVO Basic is a TLC based disk. The Samsung MLC disk are far more expensive, starting below 2 GB/€. It a sign of a very competitive market, and further decrease in prices ahead. Finally, lower solid state prices also benefit memory cards and USB sticks. The Sandisk Cruzer Edge 64 GB drive now gives most storage for money. A bit further down, the Sandisk Ultra 64 GB and 128 GB SD cards are good large capacity options, although with slow 30 Mb/s read and write speeds. For top write speed, at an impressive 280/250 Mb/s read/write, see the new UHS-II based 64 GB SDXC card. Exchange rate: 1 Euro = 1.210000 CHF. 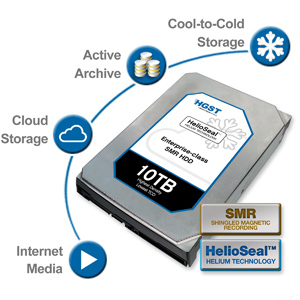 In this week’s news, Hitachi GST (HGST) announced a 10 TB HDD. It ups the earlier announcement by Seagate of a 8 TB disk. Although both companies claim the disks are “shipped”, they are nowhere near consumers yet. Both are shipping samples to a select few partners. Tech writers are ecstatic, though, and are happily re-publishing most of the official press release. 10 TB in a 3.5″ HDD is an impressive feat in itself, however the technology used to achieve it might mark the end of general purpose magnetic disks: First, this is another helium based disk from HGST, which stacks seven platters. It remains to be seen how long the helium can be contained within the disk, but is probably a lot shorter than the shelf-life of an air-based magnetic disk. Regardless of lifespan, what makes the 10 TB milestone less impressive, and even slightly worrisome, is the seven platters. That is a one-time trick. 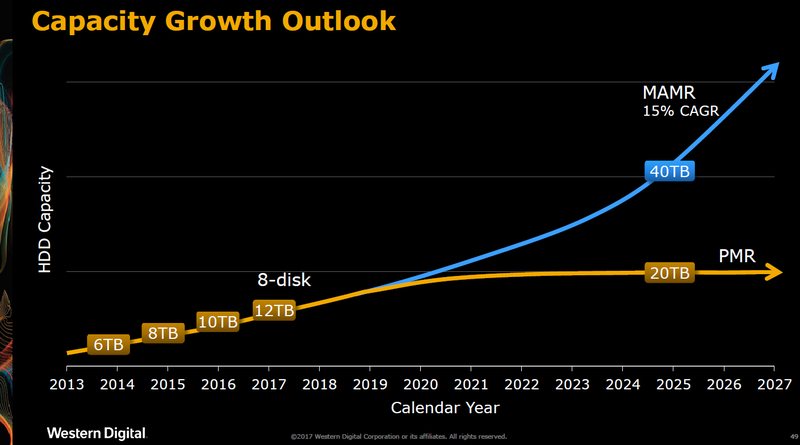 We cannot expect disks with even more platters stacked on top of each other in the future, so growth will not continue that route. It has to come from increased areal density of the bits per platter. The brings me to the second issue with this disk: Areal density is achieved by so called Shingled Magnetic Recording (SMR). As explained by Seagate, it means that each data track is stacked slightly above the other, just like shingles on a roof. To make this work, existing data has to be re-written if something is changed in neighboring tracks. This could result in delays when writing data on an almost full disk. Furthermore, it will require special handling by the OS (in case of the “host managed” 10 TB HGST disk). Implementing that right might not be trivial. SMR based disks are in other words not drop-in replacements for all applications. Although, for scenarios which are write once (or infrequently), and read often, this is not a problem. Combined, these two technologies will most likely take us to 20 TB and beyond. Assuming the 8 TB Seagate disk used five 1.6 TB platters, a seven platter disk would give 11.2 TB. That is of course the advantage of more platters, it amplifies any advance in areal density. Between five and seven platters, the factor is 1.4, and between four and seven it’s 1.75. 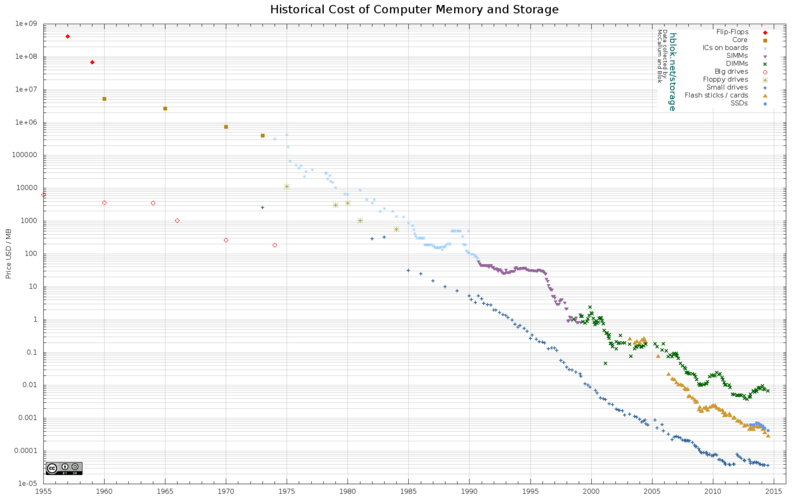 The trend of ever decreasing HDD prices will continue, even though the products might not be for everyone. It was only a few days ago I mentioned Western Digital’s new 6 TB disks. It seems Seagate got nervous, and are now claiming to “ship” 8 TB disks. However, it is a misleading headline at best: The drives in question are not on sale anywhere, and only special “pre-production prototypes” have been given to few select partners. Furthermore, the initial batches will be aimed at enterprise customers who can afford them. As an early-adopter strategy, that makes sense, but it means you will not get your hands on one any time soon. So, the prediction from a few days ago holds: 8.4 TB is already within reach, with 7 platters * 1.2 TB, but needs special technology like helium filled drives. We will probably not have 8 TB drives before 2015. The bit-tech article is also very light on technical detail, presumably because Seagate holds their cards close. There is no mentioned on how they have gotten to 8 TB, only that 10 TB might also be within reach soon. The later would be very interesting, since even with 7 platters it means an increase in areal density to 1.4 TB per platter. Or if we assume 5 platters, an impressive 2 TB. That will probably not reach the market before end of 2015, possibly 2016. Earlier this week, Anandtech could report that Wester Digital has finally taken the next incremental step in spinning HDD size. The WD Red series will now come in sizes of 5 and 6 TB, as will the Green series. 6 TB is accomplished using 5 platters, which is a new trend for Western Digital. As mentioned earlier, the five-platter technology was acquired from Hitachi, and we now start seeing them in NAS type WD drives. With five platters, it means each has 1.2 TB, which is shy of the 1.25 TB expected this year. It is important, since it means the 5 TB version also contains five platters, of 1 TB each, rather than 4 * 1.25 TB. As the AnandTech article points out, WD is still using Perpendicular Magnetic Recording (PMR) technology, as in previous drives. It means that the 1.2 TB areal density should be easily compatible with the HGST seven platters helium drives. That should make 7 * 1.2 = 8.4 TB drives immediately possible. However, as marketing seems to be focused on whole integer increments only, expect 7 and 8 TB drives in this combination. That would be in line with the predictions seen here last year. As for price, the WD Green is not yet announced. 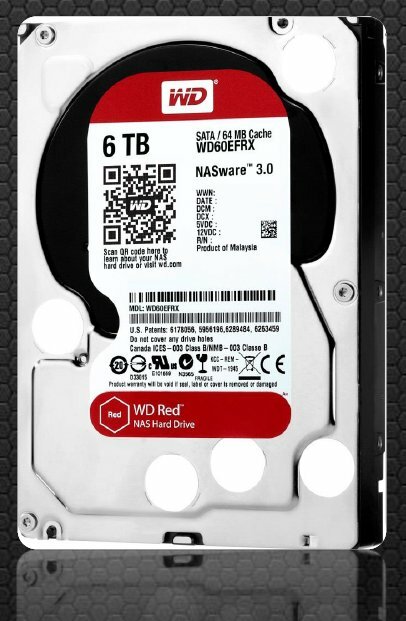 For the Red series, 5 TB will be $250, and 6 TB $300, which puts both in at 5 cents per GB. That is 39% more expensive than the cheapest Seagate 3 TB disk in the storage graphs. However, the newest and biggest drives always start at a premium for the early adopters. These new drives will probably mean that the previous step, 4 TB, will rise to the top as the best GB per buck. 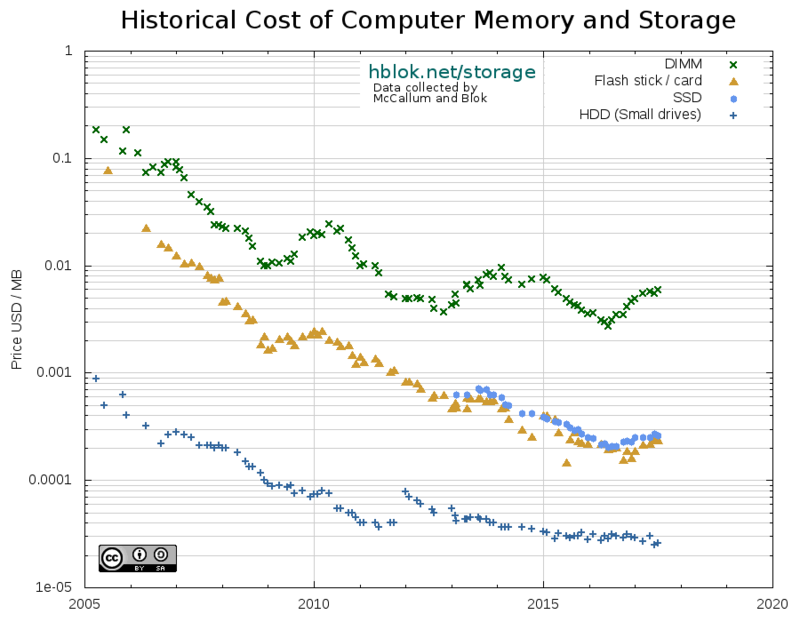 I’ve finally gotten around to update the graph and data at hblok.net/storage. Since it has been a while since last time, I thought I would be left with a gap in the data. However, John C. McCallum who collected the original data got my back. I’ve incorporated his newer data points, as well as automated my own collection. Hopefully, it will not go quit so long between updates in the future. 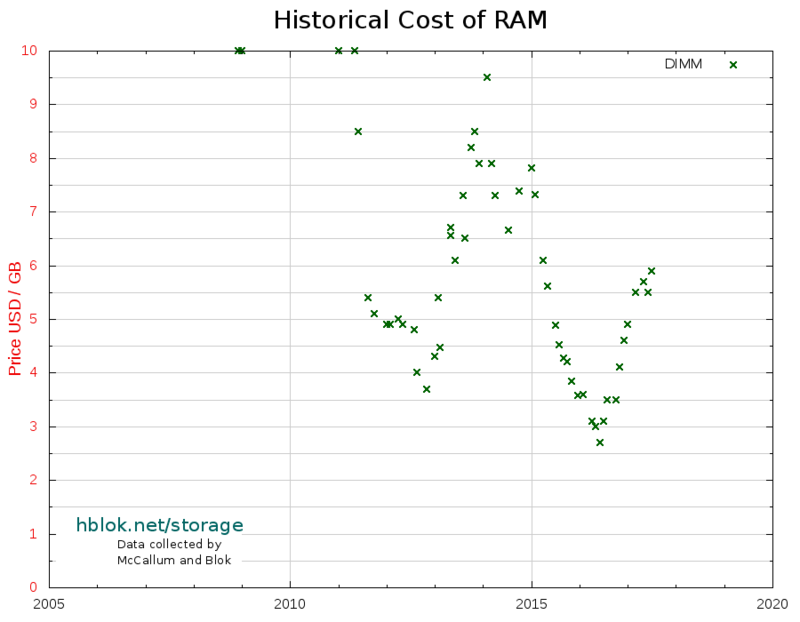 Due to a fire at the Hynix Fab plants in 2012, RAM prices are significantly up, and still at 2012 prices. Joel Hruska at extremetech.com has an interesting analysis into its effects. In the chart below, he notes that prices doubled after the fire. The latest data I’ve collected show that it’s going in the right direction again. However, as Hruska also points out, the market for desktops is in decline, and laptops, tablets and phones will not need the same memory types. In 2011 flooding in Thailand caused major damage to HDD factories of Western Digital, Samsung, and Toshiba. Prices have almost recovered from that by now, however it means a set-back in the HDD trend by almost three years. 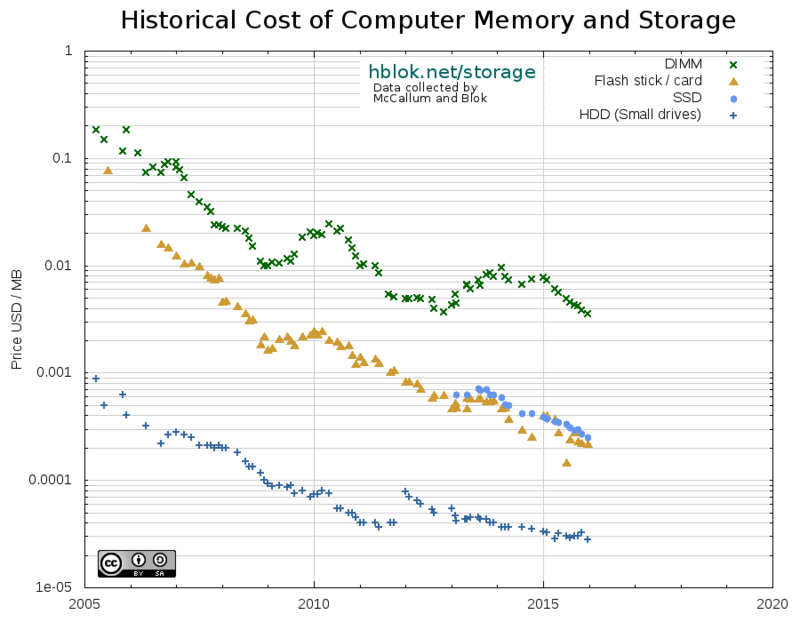 In another article by Joel Hruska, he includes the graph below from Backblaze who plotted real and estimated prices on different HDD types. Although he takes issue with Backblaze’s extrapolation, it did get the significant lag of the trend right. Furthermore, larger drives have yet to materialize. The 6 TB HGST (owned by Western Digital) Ultrastar He6 has been out for a while. Paul Alcorn at tweaktown.com discussed the details in a review a few months back. The trick is to put a whopping seven platters into the drive (as opposed to the normal three to five). However, to make that work, the drive has to be sealed and filled helium; thus its name. 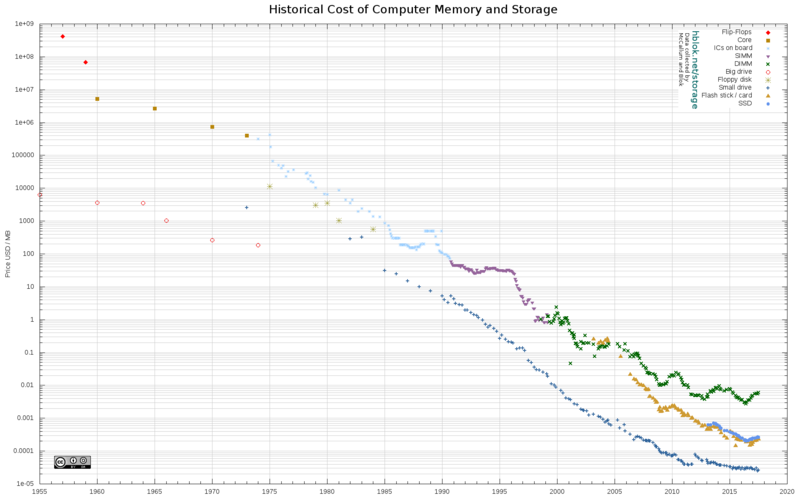 The new technology comes at a higher prices: It retails at Amazon for $476.99, or $0.0794/GB. That’s more than double the Seagate 3TB at $109.99 or $0.0367/GB. So although the helium technology has a long way to go, it could be the next step for higher capacity drives. At 6 TB over 7 platters, each hold only 857 GB. That is a bit off from the 1 TB platters which have been available for a long time now, and we were “promised” 1.25 TB platters by the end of this year. If the later are compatible with the “7Stac” technology, it could mean 1.25 * 7 = 8.75 TB drives in the future. If pricing also improves, it could be that the magnetic hard disk trend is back onto its 40 year track. 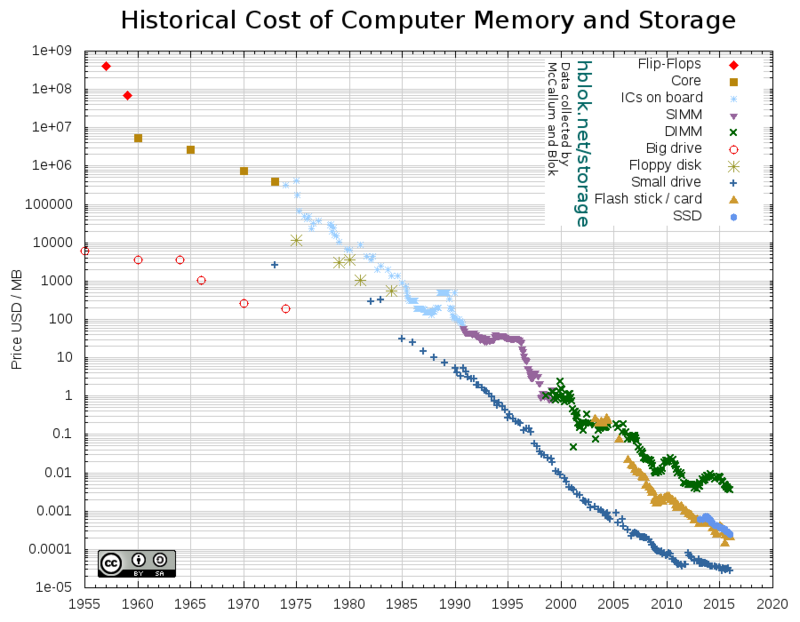 Flash memory and Solid State Drives have no accidents hampering their growth and price decline. The trend is linear (i.e. on the logarithmic scale) over the last ten years. Larger drives are also gradually becoming available, with SanDisk recently announcing their enterprise 4 TB Optimus MAX SAS, and predicting 8 TB SSDs by next year. 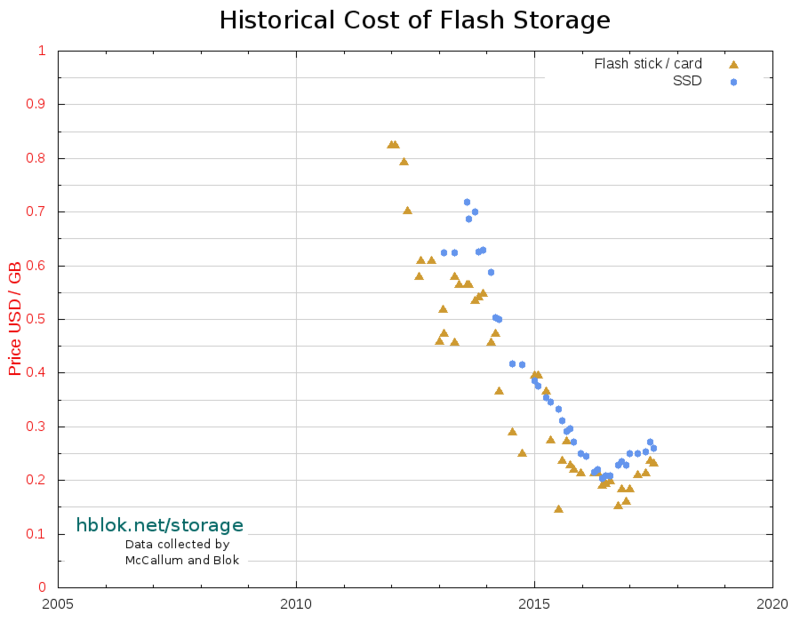 In that Computer World article, they’ve included a Gartner graph, seen below, which predicts SSD price parity with HDD by 2017. It’s important to note that they compare enterprise drives here, which live in a completely different world than the cheapest and biggest consumer drives. 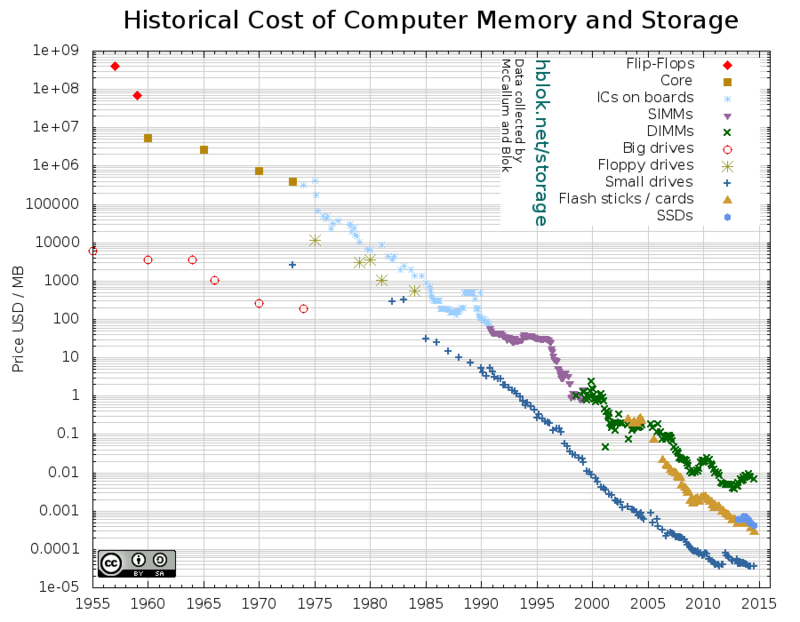 For the chart I’m tracking, it is mostly the USB sticks that make it to the top, with the best price / capacity ratio. At this point, it seems that is not because the USB sticks are getting larger, but rather that the smallest ones are getting cheaper. SanDisk is now “giving away” 8 GB drives for less than $3 (although that does not give you free shipping at NewEgg).